For persons with disabilities, taking a shower is no small task. Bathing is supposed to be relaxing, but it can sometimes feel downright terrifying. The possibility of falling and getting bumps and bruises or ending up in the hospital can cause this to be a dreaded task. Instead of risking your health, here are several reasons why owning your own shower chair is a good idea. 1. Helps to improve your safety. Do you ever feel afraid of taking a bath or shower? The possibility of falling is most likely on your mind and a shower chair or bath chair can help put your mind at ease. Using a shower chair or bath chair helps to increase safety by decreasing the chance of you falling by providing a secure area in a slippery shower or bath. Shower Chairs and Bath chairs are especially useful for those that are in wheelchairs, the elderly, or anyone who finds excessive movement painful or difficult. You do not want to risk falling and possibly ending up in the hospital and causing yourself pain. 2. Hygiene is so important. Bathing while traveling can be a nightmare for people with limited mobility. When you own your own personal shower or bath chair you can take it with you! Who really knows how clean the bath and shower chairs at hotels really are and why should you put your health and hygiene at risk? Is it clean? Is it sturdy? Is it broken? A shower or bath chair is a very personal piece of equipment and using one that others have used leaves you to wonder. You don't want to risk infecting yourself with another's virus or bacteria or using equipment you are unfamiliar with and unsure of its safety. 3. Makes you more independent and feel more empowered by helping you get to the shower or bath. Whatever your needs, there are different options to personally accommodate you and the specifications you need. There are shower chairs and bath chairs with wheels to help you get to the tub, chairs with wide seats or regular sized seats, Commode Seat Shower Chairs and Bath Chairs (with a hole in the seat to be able to use it like a toilet seat), reclining shower chairs and bathe chairs, and more. 4. Improves the quality of your life. People with disabilities or that are confined to a wheelchair suffer much more than just limited mobility. There’s a sense of needing and becoming dependent on other people when you can’t do the little things for yourself anymore and that can have a very negative impact on one’s quality of life. A little bit of independence can go a long way when it comes to a person’s quality of life. Owning a shower or bath chair can help you be and feel more independent. The warm water feels so good on those aching joints and muscles and you may find that you may finally be able to relax in the warm water and wash away any worries of the day. 5. It's yours. It's truly a great piece of personal equipment to own that you can rely on. You know if it's clean, how to use it, and what materials it's made out of. Use it at home and pack it up with you when you travel. You will never know how you could have done without one. If you have limited mobility, please don't risk your health. Use a shower chair or bath chair. There are a wide variety of Shower chairs and Bath Chairs for your needs. You will be happy you have one! Made of PVC, it offers strength comparable to steel or aluminum, yet is much lighter in weight, will not damage your tub if dropped and it will never rust or corrode. Its foam cushioned seat is comfortable and easy to clean. The Quantum 100C-CT is a fully Folding PVC portable bath and shower chair that is also perfect for travel needs for the disabled. It fits virtually any bathtub. The German-Engineered Otto Bock brand has a long history in the durable medical products market. This model comes in 4 sizes, click here (and scroll down) for size chart. Suitable for ages 1-18 or a small adult up to 65" tall and up to 159 pounds. This chair can rise to the height of the bath tub edge or lower to the floor of the tub - allowing the child to relax comfortably in the warm water. This NUPRODX shower chair won't rust or corrode, It is constructed of aircraft-grade aluminum, brass, stainless steel and durable plastics. It's engineered to be light, strong, portable, and built to last a lifetime, likely making it the first and last shower / commode chair you'll buy. Wheels or tilt, no wheels or no tilt, this model comes in a variety of models. Healthline products are proudly manufactured in the USA. Healthline PVC and aluminum are the ideal solution to handicapped access. With a very strong PVC construction and an anti-tip design, these PVC access chairs are designed to operate in showers and pool environments. Features a swing-out armrest for lateral transfers and retractable footrest. Shower platforms are an economical solution to raise shower floors to accommodate wheelchairs. The PVI shower platforms are custom built to fit existing shower basins (in rectangular shapes only). They feature durable lightweight aluminum construction and the will not rust. The perforated surface allows water to drain through easily and the surface contains strips of anti-slip traction tape. For more about Shower Chairs and Bath Chairs or anything about mobility products click on this link: All Terrain Medical. 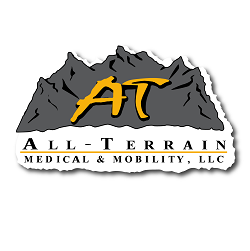 Contact us to find out what we can do for you, or speak with one of our representatives through our Live Feature chat option or e-mail us at customerservice@allterrainmedical.com.